Gloria, Master Wedding Planner, worked with mother and daughter who are both very busy. The theme they decided upon was a Classic Winter Wedding. The contracts were signed for venue and church which left only 6 months to plan and execute the Winter Wedding. After contracts were signed, we met at the venue to walk through 2 spaces, one floor for cocktails and one floor for reception. At the meeting, the Floral designer and Carmel Wedding Planner made suggestions and all seemed agreeable. The director for the venue was helpful saying what could and could not happen in Scottish Rite Cathedral, a historic building. We then transitioned to more meetings, one with the graphic designer Laura, who was hired to do blow-up posters, banners on either side of the band, gobo and design various signage. Another meeting happened with the lighting designer to specify what was needed and where. The floral designer and Indianapolis Wedding Planner, Gloria, orchestrated a linen meeting with pre-selected 10 or more choices of linen in gold and ivory. The final selection became one. Following the meetings for space and design, the family requested a Prototype meeting and tasting. We brought in the selected linen (the underlay was changed from ivory to gold), and the flowers. The low centerpiece was changed to on-the-table tray with more flowers. The menu was narrowed to a selection of hors d’oeuvres, filet and salmon choice of entrees, and a late night snack of grilled cheese mini sandwiches and tomato bisque soup shooters. We searched for gold and crystal table frames and found the perfect one. 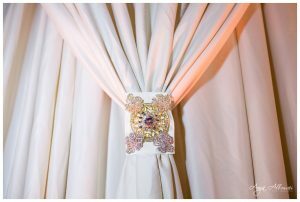 Since the table frames had rhinestones, we thought the Napkin rings with bling would be perfect. Gloria found two on-line and the final decision was made. At the tasting we added more décor for the guest tables in style B (low centerpiece). 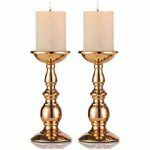 We purchased enough gold pillar candlesticks to serve on 20 tables. Moving Flame candles were a must: Gloria has an account with Lightli, which have the most realistic looking flame. We purchased enough for 12 candelabra – then enough more for the pillar candlesticks. The photographer wanted the stairs and the window ledges at the reception filled with candles. We shopped for black lanterns for my client and bought 12 for her. To add to the magical candlelit ambience, we purchased more moving flame candles for outside. The florist suggested ivory draping for the balconies in the ballroom. We ultimately decided on ivory for the sides and gold for above the head table. 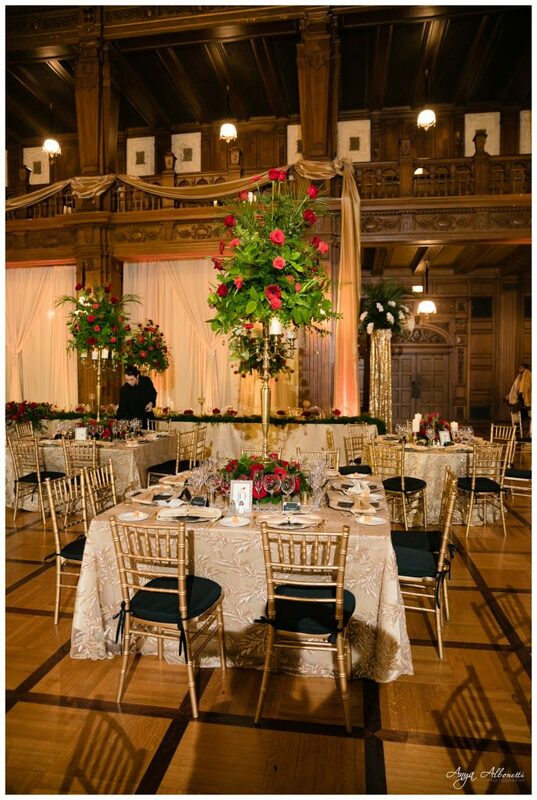 To further fill up the volume of the Grand Ballroom, the floral designer also wanted to design four columns with greenery on top. The mother of the bride asked that these be black and be swagged in a gold sequin fabric. Gloria also fashioned two rhinestone tie backs by combining a large rhinestone ornament and three rhinestone pins – to give it the size it needed. These tied the draping behind the head table. Finally, the bride asked for her head table to be filled with candlelight. We purchased many different votive holders, to give the head table an elegant look. 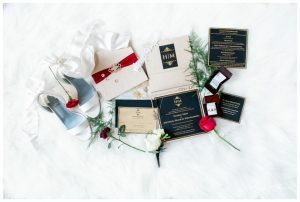 The design team of Gloria and Gene helped the mother and daughter select their invitation. The final Invitation is a silk clamshell folio with crimson red ribbon on the cover and Crystal/gold rhinestone buckle. The invitations were mailed in a box with gold tissue. Designer Laura made an icing that incorporated their monogram, border from the invitation, and the return address and guest address. This was an Events by Design invitation from start to finish. The printed pieces were ordered from out of the country. They were black matte card stock printed in gold foil with a simple serif font. We designed a monogram of the Bride and Groom first initials with a header and footer surrounding it. This became the branding for the entire wedding. The monogram was also used for the gift boxes that were delivered to the hotels.